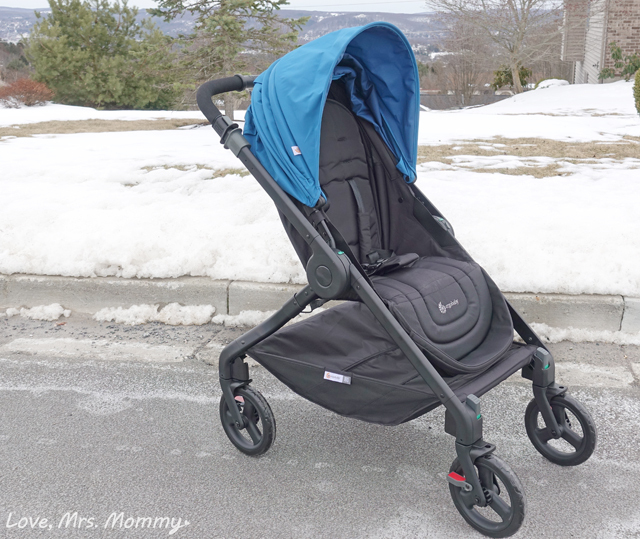 Love, Mrs. Mommy: Head-Over-Heels for the Ergobaby 180 Reversible Stroller! 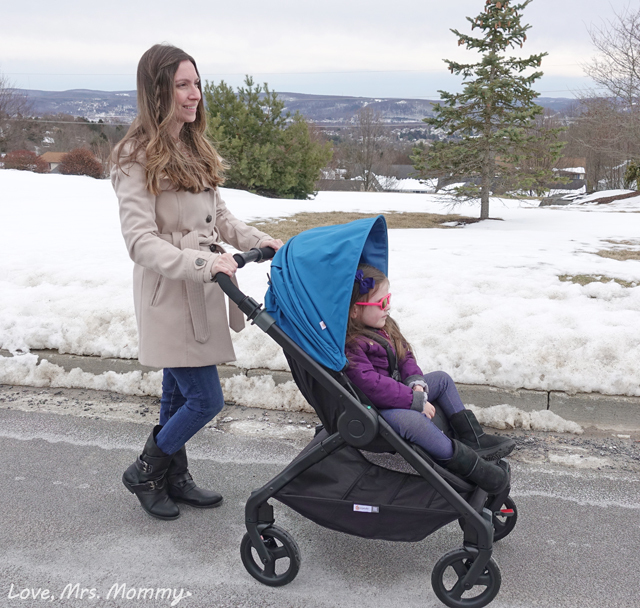 Head-Over-Heels for the Ergobaby 180 Reversible Stroller! I’ve checked out a lot of strollers in my day and most all of them, well, don’t rock my world. They’ve never really had the functionality that I wanted, for me or my child, let alone style. Well my friends, have I got a treat for you! Low and behold…. 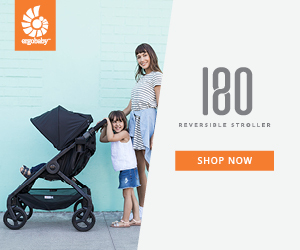 it’s the Ergobaby 180 Reversible Stroller! It’s going to flip and switch your stroller world in a whole new direction! I was thrilled to find out that Ergobaby actually interview thousands (!!) of parents to bring you a stroller that delivers everything on your stroller wish list… all-in-one! Amazing! Now you know, you are going to be pleasantly surprised with all that this stroller can do! The Ergobaby 180 Reversible Stroller can be used from the day your baby is born, all the way to pre-school! That’s right, it can hold up to a 50 lb child! No need to switch strollers during infancy, this one is the only one you will ever need! It’s even compatible with Graco and Chicco Car Seats (with the Car Seat Adapter), so you can put your sleeping baby right in the stroller without having to carry around that cumbersome carrier when you are out. Ok, so I love everything about this stroller, but I gotta start with my absolutely favorite feature! It’s the reversibility! Yes, you can actually switch the stroller so that your baby can face you, or the world, without having to move the seat, or them!! Eek! This is so amazing and super easy to do, too! All you have to do is pull up on the handlebar levers (one on each side) and flip the handlebar over to the other side until you hear a click. After you do so, please remember to always correctly set your wheels when you flip the handlebar. Since we are talking about the wheels, this is really neat! 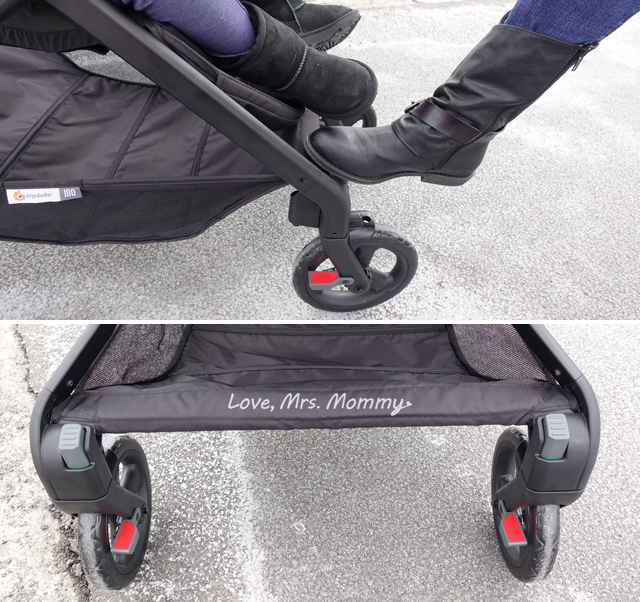 On all four wheels, Ergobaby has a breaking system installed, that’s super easy to use! All you need to do is push down on the appropriate wheel locks with your foot, so that the green strip is no longer visible. You can either turn each wheel you want locked with your foot (to make sure the wheel is in place), or you can just push the stroller and the wheels will automatically lock for you! So cool! You can use the 4-wheel steering, where all the wheels are unlocked, but only do so on a smooth level surface, like in an airport or mall. Otherwise, it’s best to make sure that the wheels that are closest to you (and the handlebar) be locked. The other two in the front can be unlocked for easier steering and mobility. This sunshade is amazing! It’s definitely larger than any other sunshades we have ever owned and can be attached very simply. Once it’s attached to the handle bar, you can expand it for the right amount of shade for your child. 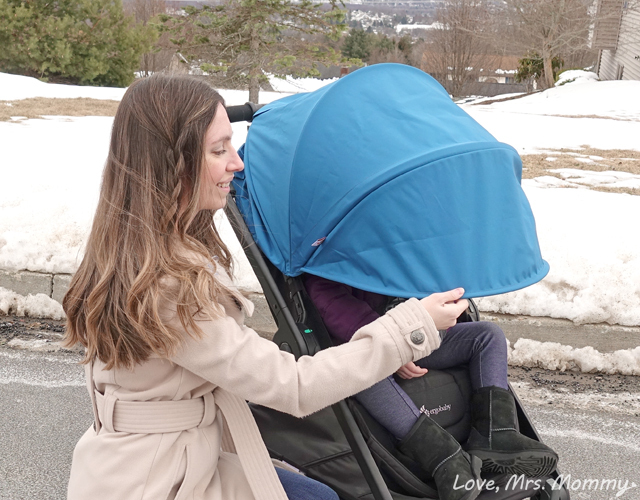 The top of the stroller shade has a handy magnetic flap that opens to a mesh viewing hole, so you can check on your sweet one without disturbing them. After all, that amazing sunshade definitely promotes a little shut-eye. Plus, this stroller can even be converted into what they call "Summer Mode". This is great for those hot summer days. My daughter’s back and head would get so hot when she was in her old stroller, because the hot air was just trapped in there with her. 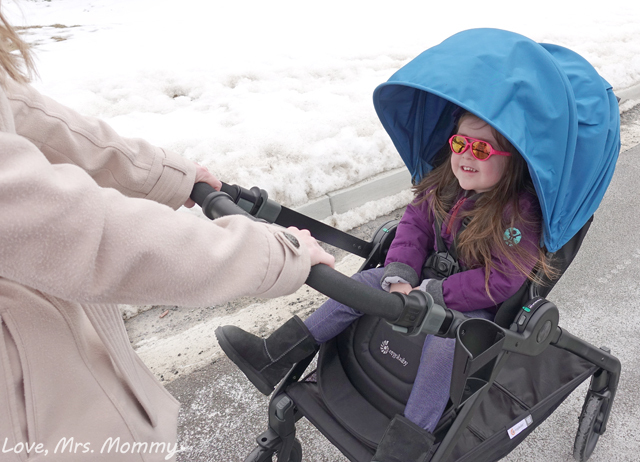 With this stroller you can roll the back panel of the sunshade up to reveal all-mesh side walls. That way you can let the cool breeze in and in return, let that hot air out! This is genius and is definitely something I am looking forward to using when the weather picks up! With so many wonderful features, it’s actually mind-boggling! Here’s a few more for you… their sturdy harness is adjustable and comfortable for your little one. There is an attachable cup holder that can accommodate a variety of size cups and bottles. 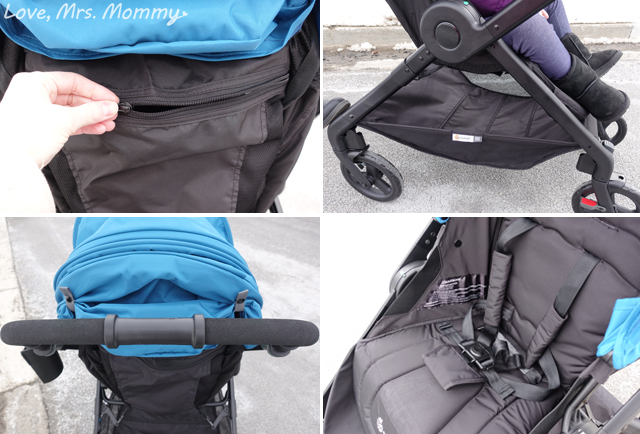 The back of the stroller has a handy pocket for your personal belongings, and inside that pocket is a reclining strap! Yes, you can also even recline the seat so that your little one can snooze more comfortably. The handlebar has a height adjustment and is easy to grip and comfortable for long walks and outings with your little one. And, I certainly can’t forget to mention their super large under-seat basket! This can hold up to 20 lbs worth of necessities for you and your little one… think diaper bag! When you are ready to pack up the stroller and head home, folding this beauty is a breeze with its one-hand release! 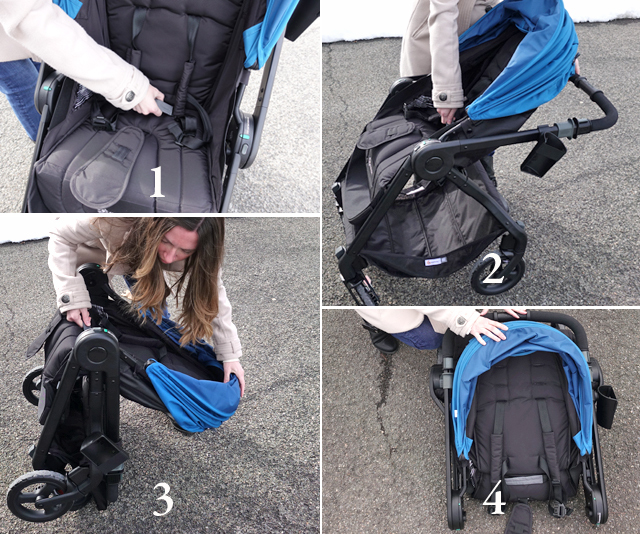 Just pull up on the fold strap that’s located in the seat and the stroller folds up in a jiffy! Check out my pictures for the folding process broken down, in almost a slow-motion fashion. And, since this stroller weighs under 20 pounds, it’s easy to load into your car! Which is definitely a must for me! Thanks to the Ergobaby 180 Reversible Stroller, your little one will be cool, comfortable, and shaded with the functionality you want and need! After all, life is about the amazing ride and journey we are on, so why not get comfy and head out in style! Buy It: You can purchase one of these awesome 180 Reversible Strollers on the Ergobaby website, or at Buy Buy Baby for $399.99! This looks like an awesome stroller! I love that you can reverse it! That is such a great feature... especially for when your little one is very young. I love the basket underneath and how compact it folds! This stroller looks amazing and sounds awesome to be able to fit a baby up to preschool aged child in it comfortably! This sounds like an awesome stroller! I love that it folds up so small! I have so much trouble maneuvering most (especially in and out of my vehicle) because they are so big!Thanks for sharing! I swear I think my back was hurting back when I was raising kids, not only from holding heavy babies, but also from carrying heavy baby strollers, diaper bags, playpens, etc I swear some of us moms had arm muscles like athletes do! I would have bought this stroller in a heartbeat if it was available back then! It was very wise of this company to listen to the actual people who will be using it!! That helps make it a winner to me! Looks like a great stroller. I love that it goes up to 50 lbs. Infant to Kindergarten! I didn't even know they made strollers! Love that you can use it for years! This looks very sturdy. The granddaughter is having her first baby and she will need one of these. Awe. She looks like she is having fun, and she looks nice and comfortable in the stroller too. This stroller looks extremely comfortable to push, and for the child to sit in. This looks like a nice stroller. I like that it steers well in both directions. I love that thos stroller has it all! We don't use strollers much around my small town, but when I had my first born, we used his imfant stoller a handful of times and it was so much trouble bc it's so big .I love that this stroller isn't so bulky. My niece could use this stroller for her little baby. Looks like a high quality stroller to use.